Dancing Stars Quilt Along: I completed 4 blocks and 10 more are in progress. I am using quick strip paper piecing technique. I can quickly whip through the top and botton row of each block but the mid section just takes long. I hope I can keep my goal of making a lap size quilt. Will have to see how it goes in the coming months. Charity Wonky Log Cabin Block: I saw a post from fellow Boston Modern Quilt Guild member Stephanie, and I wanted to pitch in one or two blocks for a good cause too. So, here is my first completed Wonky log cabin block which I will be sending out soon. February was extremely busy and couldn't find much sewing time to post my FMQ lessons. I will be posting them soon. Also trying to make a video tutorials is little harder than I thought, with the time limits on the YouTube and not having proper software to fine tune the tutorial. So, will do a combined one next week for February and March. Now getting to this month's block tutorial. First start with the center piece. Any square or rectangle is good. No worries if its not perfect square, the wonkier the better. Now align the ruler with your wonky cut and trim the excess from the strip your going to add. I decided to press the seams open for this project. Since the strip being added to the blocks are wonky I want the block to lay flat and pressing seams open does help with that. Now add a ring of neutral fabric of your choice. I choose to go with white for my blocks. I was working on this all day yesterday to finish up the quilt top. Instead of stacking the alternate block on top of one another. I just added a little twist by adding sashing to one of the end blocks in each row to create this tumbling block effect. I really love how the quilt top came together. Now have to decide whether I need to add some white border or skip it. What would you suggestion? Please leave a comment. Follow my blog with Bloglovin Happy Quilting! For a while I have been trying to get my daughter into sewing. This is an on and off project. Sometimes we do lot of stuff together and then it stalls. She does love to go fabric shopping with me and spends as much as I do ;). 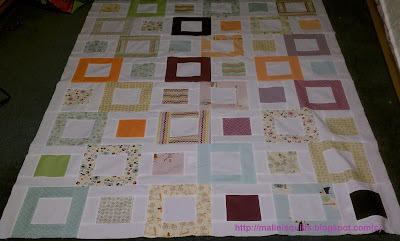 This is a super simple quilt with some applique and charm square border. The design idea except the border was my 5 year old daughters and I put it together for her. This is a great project for us together. Keeping things really simple and letting your guard really helps to introduce the little ones to sewing/quilting. Now linking up with Lee's W.I.P. Wednesday @Freshly Pieced blog. I am working on a few different things. I am hoping that in March I should just focus on finishing up WIPs. The blocks for Star Burst quilt along are all done and now I have to put the top together after I finish working on my high priority project, blogged here. Now linking up to WIP Wednesday@Freshly Pieced. I finally cut into my fabric for Dancing Stars quilt along @Amy's Creative Side blog. 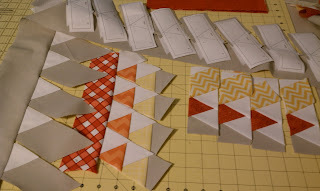 I am using "Peggy Martin" Quilt Strip Paper Piecing technique to make the blocks. I haven't finished any blocks yet but this method seems to be faster. I like simple yet fast ways of piecing. Right now I am in the process of making 15 blocks in Kona Ash background. 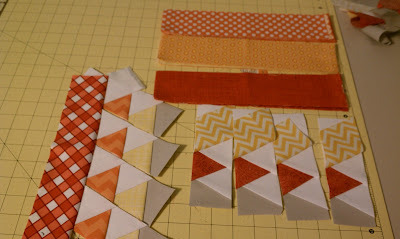 And from my color wheel bundle I chosee the yellows, orange and reds for these blocks. My goal for March is to have 15 completed blocks. Let's see how it goes. I really had fun making these blocks. Each block is 32inch square. I am thinking of adding some shashing and borders to make the quilt measure 80x80inches. Just one block with some border would make a cute baby quilt.